Trump Turnberry is a golf resort located on the coast of the Firth of Clyde in South Ayrshire, southwestern Scotland. It comprises three links golf courses, a golf academy, a five-star James Miller-designed hotel from 1906, along with lodge and cottage accommodations. The prominent rock island Ailsa Craig is visible to the southwest. Trump Turnberry was designed as a popular golf course and resort from its inception, and was made accessible because of the Maidens and Dunure Light Railway. It was closed during both World Wars for military use, and there was concern it would not open following World War II, but it was redesigned by Mackenzie Ross and re-opened in 1951. The course was the scene of the celebrated 1977 Open Championship, where Tom Watson scored a close victory over Jack Nicklaus. The property has been owned by the Trump Organization since 2014, bringing controversy to the resort. 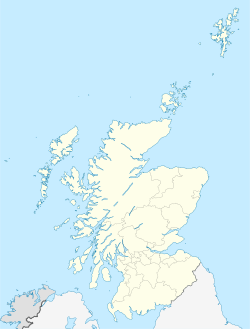 The resort is around 50 miles (80 km) south of Glasgow, located on the A719, just north of the A77, a major road from Glasgow to Stranraer via Ayr. It is sited on headland along the Firth of Clyde, overlooking the Isle of Arran and Ailsa Craig, a small granite island. The idea of the course came from Archibald Kennedy, 3rd Marquess of Ailsa after the announcement of the Maidens and Dunure Light Railway in 1899. The line would follow the Ayrshire coastline from Ayr to Girvan. 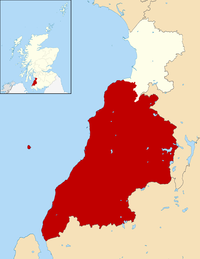 The Marquess owned 175 acres (71 ha) of land at Turnberry Green, south of Maidens, which was infertile and unsuitable for agriculture, and therefore an ideal golf course location. He realised the new railway would provide easy access for people wanting to visit a quality course. Following construction of the line, he asked 1883 Open Championship winner Willie Fernie to design a suitable course. Fernie designed an initial round of 13 holes in 1901, with a second round following later. The hotel was designed by station architect James Miller, whose other work included Glasgow Central and Stirling railway stations. It was built adjacent to the railway, and opened concurrently with the station on 17 May 1906. The course was intended to attract visitors from across Britain, and was advertised heavily in the national press. The property was used as an airbase during World War I, and a landing strip built for this purpose still exists, now disused. During this period, the Royal Flying Corps trained pilots in the arts of aerial gunnery and combat, and the Turnberry Hotel was used as a hospital for the wounded. After the war, courses 1 and 2 were rebuilt and renamed "Ailsa" and "Arran". A memorial to honour lost airmen was erected on the hill overlooking the ninth hole of Ailsa, which is still standing. The cycle was repeated for World War II. The hotel was commissioned as a hospital, and the golf courses were seconded for air training for the Royal Air Force (RAF); it is thought that as many as 200 died at the base. The hotel and golf course was served by its own dedicated railway station. Turnberry railway station opened in 1906 and operated until 1942, when the Maidens and Dunure Light Railway line was partially closed. Following the war, the course was in need of refurbishment and the hotel was in a dilapidated state. Frank Hole, chairman of British Transport Hotels, convinced the Government that golf courses should be rebuilt and restored. The architect Mackenzie Ross rebuilt the course, removing the wartime runways and covering the land with sand and topsoil. Ross is credited with restoring the courses to their high quality, and the Ailsa course was re-opened in 1951, a seaside links with views of Ailsa Craig and the Isle of Arran. The hotel was bought by Starwood Hotels & Resorts Worldwide, Inc. in 1997, and until October 2008 was operated under the Westin brand. In October 2008, Leisurecorp, Dubai World's sport and leisure subsidiary, purchased the resort, with Starwood Hotels & Resorts continuing to manage operations under the Luxury Collection brand. Donald Trump purchased the hotel and golf courses from Leisurecorp in April 2014 for $60 million, and the resort was renamed Trump Turnberry that June. Trump resigned his directorship of the companies which own Trump Turnberry in January 2017, just before he was inaugurated as President of the United States, and passed control to his sons Eric and Donald. The Trump Organization spent about two hundred million dollars on renovating the course. Donald Trump remains the owner of Golf Recreation Scotland, which in turn owns SLC Turnberry. Turnberry Lighthouse at sunset surrounded by the golf course. The Ailsa Course, redesigned by Mackenzie Ross between 1949 and 1951, and again by Martin Ebert between 2015 and 2016, has staged The Open Championship on four occasions (1977, 1986, 1994, and 2009). It has also hosted many other important golf tournaments, including the Women's British Open in 2002, the Walker Cup in 1963, the Amateur Championship in 1961, 1983, 1996, and 2008, and the Senior Open Championship on seven occasions, 1987–90, 2003, 2006, and 2012. The Ailsa Course is featured in the 2004 golf video game Tiger Woods PGA Tour 2005. The other two courses at Turnberry are the Kintyre Course and the nine-hole Arran Course. The Kintyre Course, opened in 2001, is another championship standard course that has hosted final qualifying for The Open. It was designed by Donald Steel and built on the foundations of the old Arran layout, which had been rebuilt along with the Ailsa Course following World War II. During the war, the resort was used as a hospital and the courses were flattened and paved for use as a major RAF airfield. The new Arran Course opened in 2002. Other golf facilities at the resort include the Colin Montgomerie Links Golf Academy, and a pitch and putt course. In 2003, the 18th hole on the Ailsa Course, "Ailsa Hame", was renamed "Duel in the Sun" as homage to the battle between Tom Watson and Jack Nicklaus in 1977; this is also the name of a sports bar at the resort. In 2009, Watson, 59, held a one-shot lead when he bogeyed this hole in the final round, eventually losing the Open Championship in a playoff. At its first Open Championship in 1977, the course was the scene of the famous "Duel in the Sun", when Tom Watson claimed a classic victory, one stroke ahead of Jack Nicklaus. The two were paired during the final two rounds and finished well ahead of the rest of the field. They posted identical scores for the first three rounds, and were tied through the 16th hole of the final round. Nicklaus missed a short birdie putt on the par-5 17th hole to tie Watson, who had reached in two and birdied. On the par-4 18th hole, Nicklaus recovered from the rough and sank a lengthy birdie putt, which forced Watson to sink his short birdie putt to win, which he did. It was the second of Watson's five Open titles; down two strokes on the 13th tee, he bested Nicklaus by three shots over the final six holes. Nine years later in 1986, Greg Norman claimed the first of his two Opens (his only major titles), winning by five strokes. Nick Price won his second major (and only Open) in 1994, a single stroke ahead of runner-up Jesper Parnevik. After a fifteen-year absence, the Ailsa Course hosted the Open in 2009, where 59-year-old Watson nearly won his sixth Open Championship. Up by a stroke at the 72nd hole, his approach shot took an unfortunate bounce on the front of the green, then ran off the back and led to a bogey. Watson then lost a four-hole playoff with Stewart Cink by six strokes; Cink birdied the 72nd hole and then posted two pars and two birdies in the playoff to win his only major title. In December 2015 the governing body for Golf, the R&A, announced that the 2020 Open Championship would not be played at Turnberry, even though it had previously been considered likely to host the tournament. The R&A were unimpressed with several racist remarks from Trump; one member said he would like Turnberry to host the Open again, but "not Trump Turnberry". Winners of The Senior Open Championship at Turnberry. Winner of the Women's British Open at Turnberry. The Ailsa Course was played as a par-72 at 6,407 yards (5,859 m) in 2002; and played marginally longer at 6,410 yards (5,860 m) in 2015. The Trump Turnberry has come under scrutiny in the Trump-Russia scandal, as it is frequently cited as a possible vehicle for money laundering by the Trump Organization. Glenn Simpson testified before Congress that "enormous amounts of capital [was] flowing into these projects from unknown sources and – or at least on paper it says it’s from the Trump Organisation, but it’s hundreds of millions of dollars. And these golf courses are just, you know, they’re sinks. They don’t actually make any money." Golf reporter James Dodson alleged that in 2013, Eric Trump told him that the funding for the Trump golf courses came from Russia, a charge Eric Trump has denied. ^ Lemon, Jason. "Trump in Scotland: What Does the President Own in the Northern U.K. Country?". Newsweek. Retrieved 17 September 2018. In December, the Turnberry course also lost a controversial tax break from the Scottish government, The Guardian reported. Scottish Finance Secretary Derek Mackay was pressured to make the changes after it was revealed earlier in the year that the Trump property had kept more than $140,000 a year due to a business rates relief scheme. ^ MacAskill, Ewen (24 June 2016). "Donald Trump flies in for Scotland visit as protesters converge on Turnberry". The Guardian. ^ Campbell & Satterley 1999, p. 137. ^ a b c d Corcoran 2010, p. 116. ^ a b Posnanski 2016, p. 113. ^ Christopher & McCutcheon 2014, p. 116. ^ a b "Turnberry at War". Turnberry Golf Course. Archived from the original on 13 July 2009. ^ Barrett & Hobbs 1999, p. 186. ^ Coyne 2018, p. 343. ^ Campbell & Satterley 1999, p. 198. ^ Campbell & Satterley 1999, pp. 137–138. ^ "Turnberry on course for a £55m takeover". The Scotsman. 22 May 2008. Retrieved 25 October 2008. ^ a b "Where Did Donald Trump Get Two Hundred Million Dollars to Buy His Money-Losing Scottish Golf Club?". The New Yorker. Retrieved 14 July 2018. ^ "US property tycoon Donald Trump buys Turnberry resort". BBC News. BBC. 29 April 2014. Retrieved 29 April 2014. ^ Carter, Iain (29 April 2014). "Turnberry: Donald Trump deal should not affect Open status". BBC Sport. BBC. Retrieved 29 April 2014. ^ "Donald Trump adds his name to the Turnberry golf resort". BBC News. BBC. 16 June 2014. Retrieved 2 July 2014. ^ "Donald Trump's name 'will boost Turnberry'". BBC News. BBC. 2 July 2014. Retrieved 2 July 2014. ^ "Trump resigns Scottish golf course directorships". BBC News. 24 January 2017. Retrieved 24 January 2017. ^ McLaughlin, Martyn (12 May 2018). "Donald Trump's Scottish resort paid by US taxpayers for 'VIP visit'". The Scotsman. ^ "Turnberry's Kintyre Course proves to be true champion". PGA Tour. 27 February 2007. Archived from the original on 2 May 2008. ^ a b "BBC – Rob Hodgetts: The greatest Open ever?". BBC News. 13 July 2009. Retrieved 2 October 2018. ^ Campbell & Satterley 1999, p. 139. ^ "Duel in the Sun", Telegraph.co.uk; accessed 14 July 2009. ^ Campbell & Satterley 1999, p. 140. ^ Roberts, Daniel (14 December 2015). "Donald Trump Suffers Another Hit to His Golf Empire". Fortune. Retrieved 16 December 2015. ^ "Donald Trump's Turnberry golf club to no longer host The Open tournament amid anger over controversial remarks". The Independent. 12 December 2015. Archived from the original on 27 December 2015. ^ "Karrie Webb (AUS): Weetabix Women's British Open". Ladies European Tour. 11 August 2002. Archived from the original on 14 July 2014. Retrieved 12 July 2014. ^ "Future venues". Ricoh Women's British Open. Retrieved 12 July 2014. ^ Davidson, Adam (13 July 2018). "Where Did Donald Trump Get Two Hundred Million Dollars to Buy His Money-Losing Scottish Golf Club?". ISSN 0028-792X. Retrieved 14 March 2019. ^ Association, Press (20 January 2018). "US Congress asks if Russian money funded Trump golf courses". The Guardian. ISSN 0261-3077. Retrieved 14 March 2019. ^ "Eric Trump Denies Telling A Sportswriter The Trumps Got Golf Course Funding From Russia". www.wbur.org. Retrieved 14 March 2019. Barrett, Ted; Hobbs, Michael (1999). The Ultimate Encyclopedia of Golf: The Definitive Illustrated Guide to World Golf Revised and Updated Edition (4th ed.). Carlton. ISBN 978-1-858-68881-7. Coyne, Tom (2018). A Course Called Scotland: Searching the Home of Golf for the Secret to Its Game. Simon and Schuster. ISBN 978-1-476-75430-7. Campbell, Malcolm; Satterley, Glyn (1999). The Scottish Golf Book. Sports Publishing LLC. ISBN 978-1-583-82053-7. Christopher, John; McCutcheon, Campbell (2014). Bradshaw's Guide Scotlands Railways West Coast - Carlisle to Inverness. Amberley Publishing Limited. ISBN 978-1-445-63404-3. Corcoran, Michael (2010). Duel in the Sun: Tom Watson and Jack Nicklaus in the Battle of Turn. Simon and Schuster. ISBN 978-1-439-14192-2. Posnanski, Joe (2016). The Secret of Golf: The Story of Tom Watson and Jack Nicklaus. Simon and Schuster. ISBN 978-1-476-76644-7. Wikimedia Commons has media related to Turnberry Hotel.